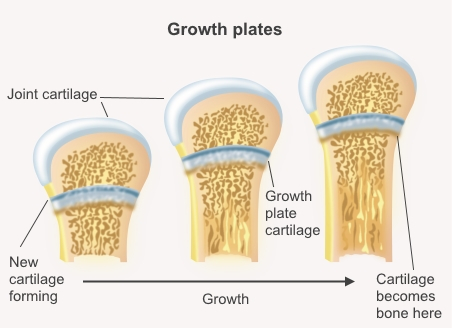 Growth plates (also called physes) are the areas of growing tissue near the ends of children's long arm and leg bones. They are discs of cartilage (a rubbery, flexible tissue) between the long, middle part of the bone (the shaft) and the area where the bone gets wider at its end (the metaphysis). The growth plate is where the bones grow. When a child's bones stop growing (called reaching skeletal maturity), their growth plates harden so the bones are hard and continuous. Girls tend to reach skeletal maturity earlier than boys. Their growth plates usually harden when they are 13 to 15 years old, while boys' growth plates harden when they are around 15 to 17. Before a child stops growing, they can injure their growth plates just as they can injure the rest of their bones. On the next page: What are growth plate injuries?